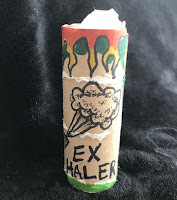 The ExHaler - make it yourself! These are dark days for decency and light hearted puffers like the readers of our illustrious blog know it's hard to hold your head high and keep smiling. But through tough times, most cannabis aficionados are hard working folks who get on with life and double down when the going gets tough. It's snowing outside? Stoners are the kind of folks who get up 15 minutes early to whack the snow off their sweetie's car. These days, Stoners are the responsible members of society while politicians disappoint and corporate titans shaft their employees. But, enough with the gloom and doom! One sure fire way to pick up your dull day (wherever you are) is to have a puff of your favorite vapor. Me, I'm vaping a Regulator cartridge on my pen vape. Perhaps you are a JUUL aficionado. Whether it is nicotine or cannabinoids (along with their requisite flavorants and smoke enhancers), a little mid-day dose can boost your dreary day. 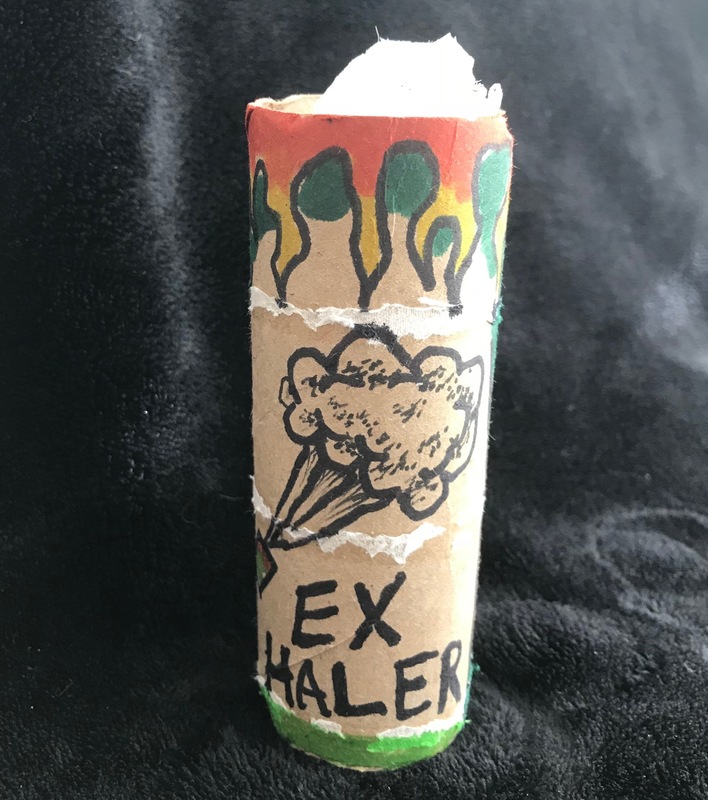 So if you want to vape or JUUL without offending the people around you, here's a helping hand from an old friend, the Ex-Sailor brand ExHaler brought to you by Stoner Living. You can make it yourself for free with stuff you (probably) have around your home. The biggest concern of would-be puffer/vapers is the concern that people around you smell or seeing the vapor you create. This is where a lit-end cigarette or joint (or blunt) is NOT a good choice if stealt is your goal. A lit cigarette or blunt or joint has sidestream smoke - as it burns, smoke continues to stream from the lit end even when the smoker is not puffing. With a vape unit, 'smoke' is only created when the device is puffed. The residual vapor will contain water vapor, CO2, flavorants and traces of the active ingredient, usually nicotine or cannabinoids. For the sake of subtlety, vaping beats smoking hands down. The best strategy to minimize the size of your vape cloud is to limit the size of your puff and to hold it in as long as possible before exhaling. With practice, a stealthy puffer may learn to 'zero' out the puffs through this strategy. But don't stop there - if you are vaping in the bathroom at work or university for instance - you need a second layer of protection. That is where the Ex-Sailor Exhaler comes in to play. After taking your thoughtfully rationed pull on your vapo-device, and holding it in until you can't hold it any longer (at least 30 seconds), exhale slowly through your ExHaler. Be sure you vent everything down into your clothing - down your shirt- or into a sweatshirt or duffle bag. This will deodorize what you exhale, but it will still look like vapor unless you blow it into something and you wait a minute before leaving the area. I learned the ExHaler technology from college friends who attended fancy prep boarding school on the East coast. 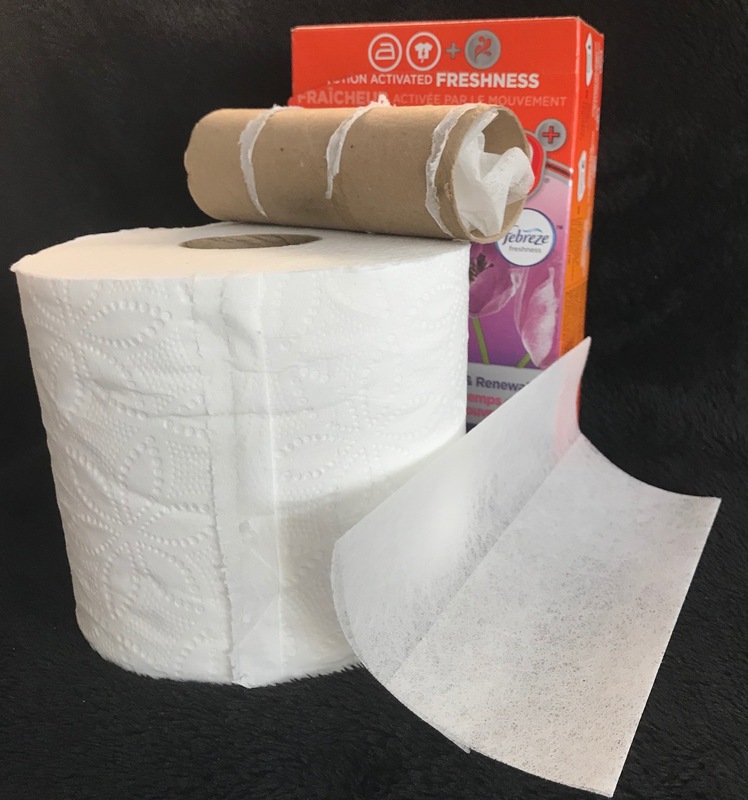 From college dorms to Amtrak cabins of yore, the ExHaler (a simple card board tube from an empty roll of toilet paper stuffed with a few rumpled up dryer sheets) has served me well in pursuit of private puffing. The beauty of the exhaler it is that it smells like you are doing laundry - pretty innocuous in the grand scheme of things. Everything you need to make you own ExSailor ExHaler! Remember that if you are following the system described above and hold in the vapor, you will probably absorb more of the active ingredients (whether it is cannabinoid or nicotine), so adjust your dosage accordingly. If you are not exhaling a big cloud of vapor because you are holding it in for a long time it goes to figure that the volume of the cloud you are not seeing exhaled remains in your body. So think about THAT before deciding to try the Ex Sailor's ExHaler system. If you are asking how to get away with JUULing at school, ask yourself if it is worth the hassle of getting busted, the indignity of having your parent or guardian informed because that is probably the worst thing that will come of it. The new nicotine delivery systems like the ones sold by JUUL appear to be 90-95% better for the user than conventional cigarettes, like Marlboro. That is according to peer reviewed studies in various medical journals. Beyond the embarrassment of getting in trouble, the enslavement to the nicotine dealers is probably the worst part of nicotine addiction. Baring a few adverse cardiovascular effects, nicotine does have some positive effects on attention and cognition, including this 2004 study that found nicotine gum improved handwriting in terms of faster and more fluid handwriting. If a JUUL lasts you a day and costs $4, that is a solid used car every 5 years or so (at $4/day, a 5 year habit costs $7,300 if you go through a pod a day). Back in 1999 I lived in an apartment building in Corvallis where I met my upstairs neighbor Serai and invited her over to hang out. My apartment had a cigarette smoking outside rule so when I pulled evening bong hits indoors while we got to know each other, it seemed polite to exhale through an ExHaler. I hung out with my new pal and exhaled all night through my lil frayed home-made device that made me imagine the neighbors thinking I did a lot of laundry. Then Serai pointed out that she was 'the neighbors'. The next day I came home from the lab to a nice wrapped present on my porch! I opened it up, and Serai delivered a thank you note and made me a shiny new Ex-Sailor complete with flame detailing. 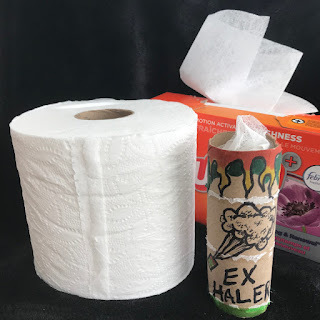 Imagining some poor sucker kicked out of the Navy for a bum pee test, Serai thought my flimsy invention was pretty cool but in need of an upgrade (Serai was not a cannabis person then or today). She heard Ex-Sailor, all night instead of 'exhaler' and I treasure the resulting Ex-Sailor she made me, along with our friendship, some 20 years after the fact. Serai has a popular cleaning business in the Corvallis area as of 2019 but I won't sully her professional image by linking to her popular service for homes and offices - but a shout out from SL all my love! Never try to vape on board an airplane - any problem or funny stuff with the restroom smoke detectors can get your flight re-routed to the nearest airport big enough to land your aircraft. Think of the inconvenience you would cause so many people - the horror and shame (and probable criminal charges)! So never, ever on the plane. But if you are in the airport waiting interminably, well, it's not a good idea but at least you probably won't be re-routing planes. 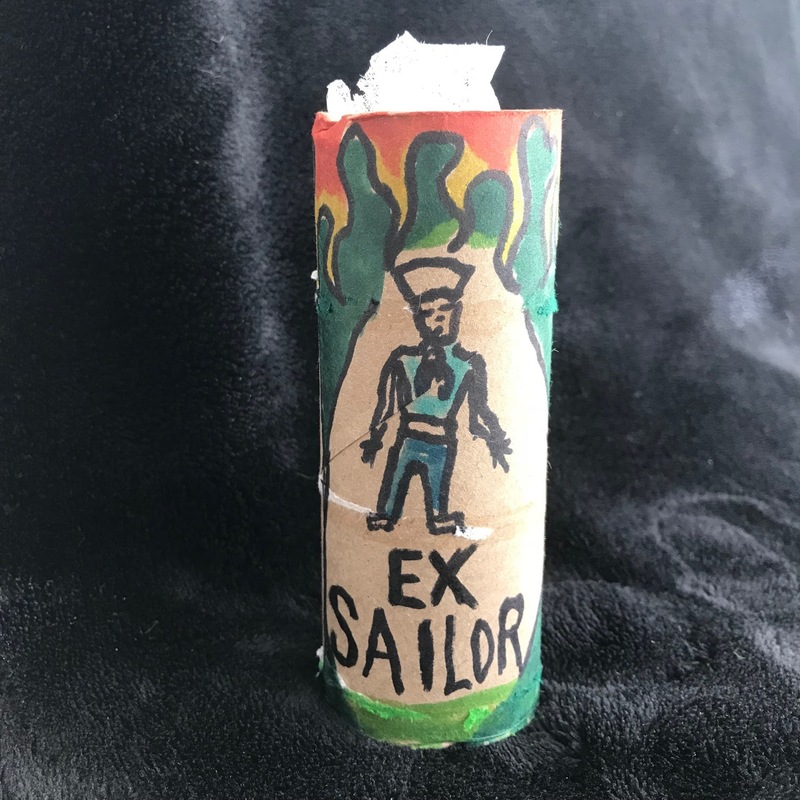 So we offer the Ex-Sailor branded ExHaler to you for your privacy and convenience. Don't get yourself in trouble - vaping should relax and enhance your life, not add stress and trouble. Be aware of local ordinances and respect them. Also consider the many years of experience your parents have before dismissing their opinions. Be good to yourselves and make sure you are treating yourself to a little break and not creating problems for yourselves. This information is provided as courtesy to vapers being thoughtful of those around them and is not intended as encouragement to break the law. (C)2019 Stoner Living Blog, all rights reserved. Article may be shared or re-posted as long as credit is given to Stoner Living.